Catching a glimpse of a Mardi Gras Indian in full regalia is a true blessing. 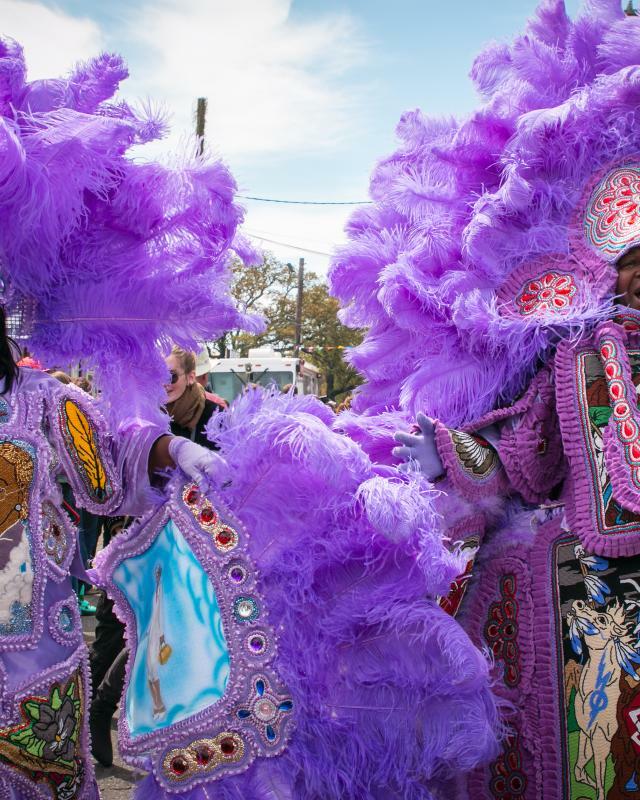 Besides Mardi Gras, if you’re lucky, you might bump into Indians at Jazz Fest and Super Sunday (the Sunday after St. Joseph’s Day). 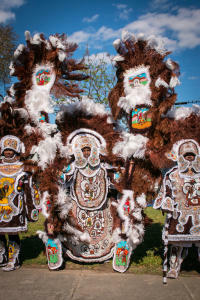 Like the Mississippi River, the origins of the Mardi Gras Indian are a little muddy. Most believe that a connection between black people and Native Americans was forged when escaped slaves found asylum with Louisiana tribes. Others believe that the Mardi Gras Indians were inspired by the Native Americans who performed in New Orleans with the Buffalo Bill Wild West Show in 1884. The say the first Mardi Gras Indian was Chief Becate of the Creole Wild West tribe who masked as an Indian at a Mardi Gras in the 1880s. 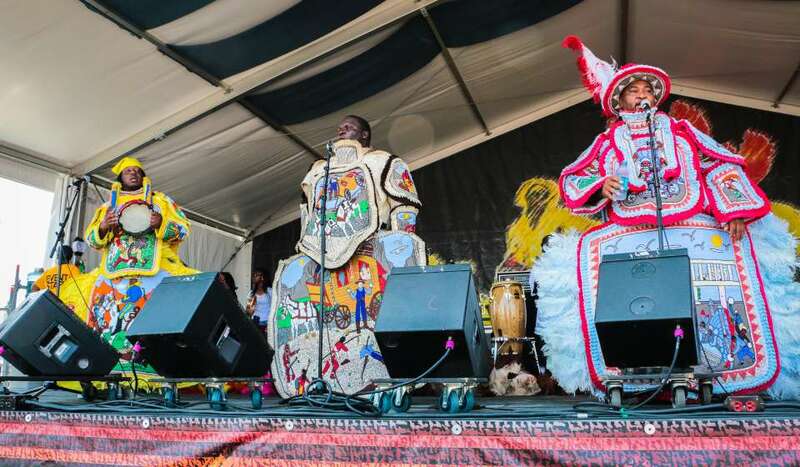 The intricate hand-sewn suits of the Mardi Gras Indians rank among the nation&apos;s best folk art. Worn just once, they are made by tribes with hundreds of thousands of beads, brightly dyed ostrich plumes, sequins, velvet and rhinestones. Each costume takes an entire year to create and can weigh as much as 150 pounds. They debut on Mardi Gras, make appearances on Super Sunday and at the New Orleans Jazz and Heritage Festival and then are torn apart with the beads reused in another design. Indians chiefs compete for the most elaborate, beautiful design each year. There are roughly three dozen tribes in the city with names like the Golden Eagles, the Flaming Arrows, the Yellow Pocahontas, and the Bayou Renegades. 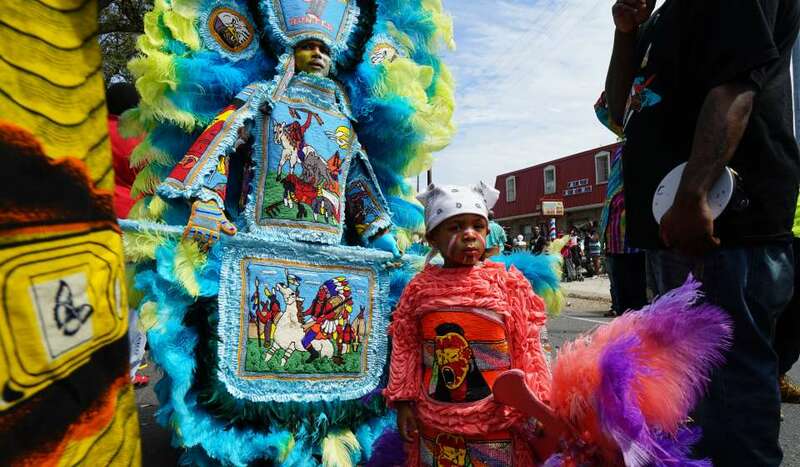 With a formal hierarchy of chiefs, spy boys, flag boys, big chiefs, wild men and more, the Indians grace the streets of New Orleans’ neighborhoods on Mardi Gras Day in friendly competition over which chief is the "prettiest." With boastful singing and threatening dances and gestures, the tribes go out seeking other tribes to "battle." Call-and-response chanting with tambourines and other handheld percussion plays a central role in the Mardi Gras Indian spectacle. 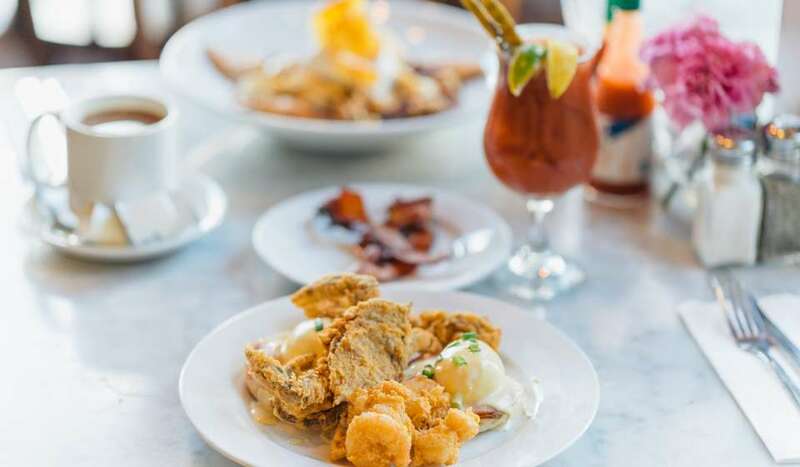 Tribes like the Wild Magnolias and the Wild Tchoupitoulas have released critically acclaimed recordings and sometimes perform professionally with full bands. 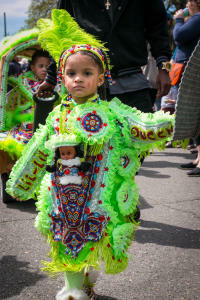 Mardi Gras Indian music has also permeated into New Orleans funk, soul, R&B and bounce. 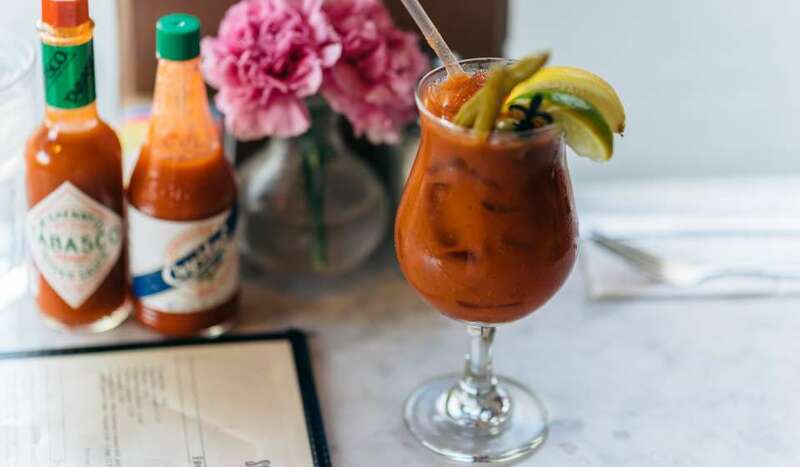 The famous New Orleans tune "Iko Iko" with the lyrics, "My flag boy and your flag boy, sitting by the fire," is rooted in Mardi Gras Indian tradition as is the New Orleans’ standard "Hey Pocky Way." 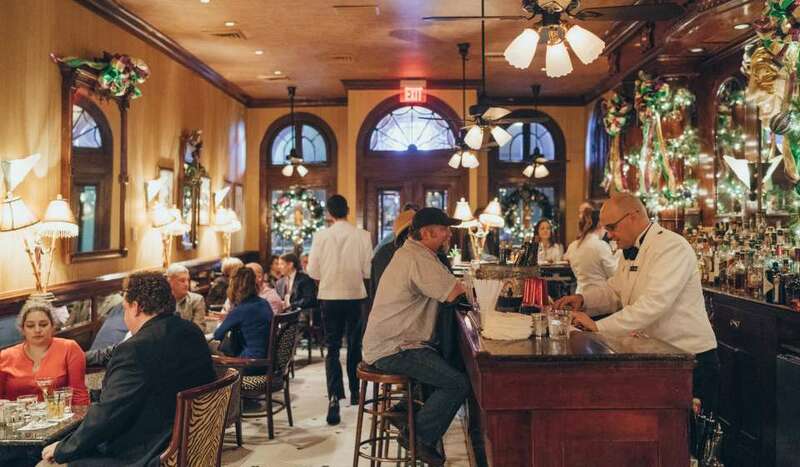 Good places to catch tribe gatherings include the banks of the Bayou St. John at Orleans Avenue, Taylor Park Uptown, the corner of Washington Avenue and LaSalle Street, the intersection of Orleans and North Claiborne avenues, near Armstrong Park, and at Hunter&apos;s Field at the corner of North Claiborne and St. Bernard avenues. 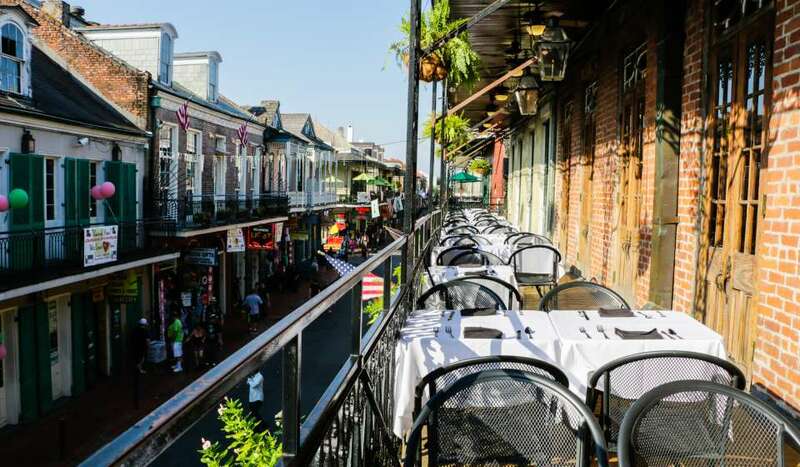 They also make appearances in historic Tremé at the Backstreet Cultural Museum, where history and costumes are on display year round.